We will continue to fund families who require assistance purchasing wheelchair accessible vans for their children throughout 2018. 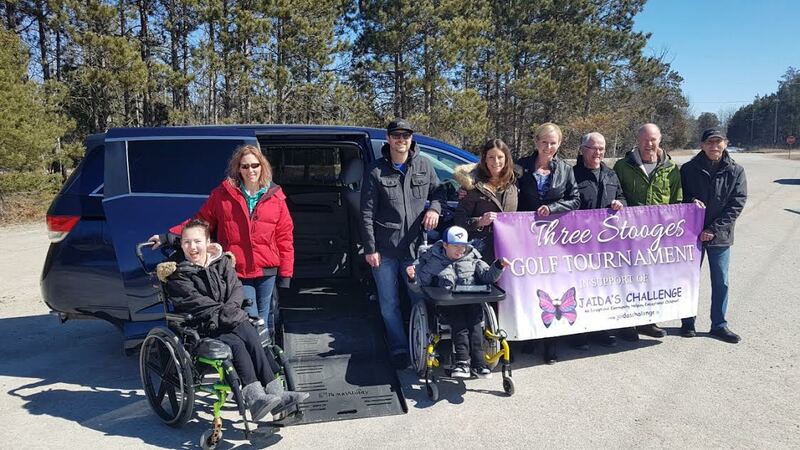 This year however we will be directing funds raised at the golf tournament to other equipment and service challenges faced by these deserving families. Over the past year, along with funding accessible vans, we have funded communication devices such as an iPad and an eye gaze machine, transportation to therapy for several children, accommodations near Sick Kid’s to help manage post surgery risk, ambulance bills not covered by OHIP, and equipment to ensure the comfort and safety of children who require various kinds of protection and support. As always you can rest assured that all of your charitable dollars will end up in the hands of those who need them, as Jaida’s Challenge is staffed by volunteers resulting in negligible operating expenses. This year our goal is $22,000! Together we can make a difference in the lives of these incredible children and their families! !